Over the past several years we have learned that small groups of people can engage in mass suicide. In 1978, 918 members of the Peoples' Temple led by Jim Jones perished after drinking poisoned koolaid. In 1997, 39 members of the Heaven's Gate cult died after drugging themselves and tieing plastic bags around their heads. Unfortunately, history also demonstrates that it is possible for an entire civilization to commit suicide by intentionally destroying the means of its subsistence. David Deming is associate professor of Arts and Sciences at the University of Oklahoma. "No," she replied, "I’m sorry, it isn’t." "The girls get $80 and the house gets $20," the Madam replied. "Now, that’s more like it!" the union man said. "I’d like her," he said. "I’m sure you would, sir," said the Madam. Then she gestured to a 92-year old woman in the corner, "but Ethel here has 67 years seniority and according to our union work rules, she’s next." Beyond farce in statehouse politics — think New York, Illinois and South Carolina — there can be danger. Think Tennessee, where the Legislature just overrode the governor’s veto and rescinded a law barring patrons from carrying handguns in bars and restaurants. Once again, politicians caved to the gun lobby’s “right to carry” agenda which insists that there is no place — campuses, workplaces, churches — that should be off limits to guns. The governor found no safety in provisions that ban the licensed gun toters from drinking alcohol — is it the honor system or will bartenders do a search? — and allow bar and restaurant owners to opt out by posting a notice prohibiting guns. Unfortunately, there is no requirement for owners to post warnings of the dangers inside at the doorways of gun-friendly places. Comment: What a pathetic, fearful existence it must be to be a New York Times editorialist. Baaa, Baaa, little sheeple. After lengthy debate, the House passed a bill on Friday that would prohibit property and business owners from banning guns in their parking areas, if the guns are locked in privately owned vehicles. Legislators also amended Senate Bill 1168 to exempt certain lots. Parking areas that are fenced or guarded, or which provide temporary and secure gun storage, would still be able to prohibit firearms. PHOENIX -- Saying it will make people safer, state senators voted Friday to let people with concealed weapons permits carry them onto college and university campuses where they are now forbidden. The 15-6 vote on the provision in HB 2439 came after backers said they believe that having people who are licensed by the state to have weapons should cut down on the number of massacres that occur on campuses. And Sen. John Huppenthal, R-Chandler, said that has happened in Arizona. He did not refer by name to the 2002 incident at the University of Arizona where three instructors at the College of Nursing were slain by student Robert S. Flores Jr. who then turned the gun on himself. But Huppenthal said the evidence shows that it makes sense, from a safety standpoint, to let people carry guns. Concerned with how a blanket ban on guns in parks will affect the city, Murfreesboro City Council chose to defer voting on the issue Thursday night. “I’d like to wait to hear from the TSSAA and see if this would affect Spring Fling,” Mayor Tommy Bragg said. City Manager Roger Haley proposed a city-wide ban in municipal parks after Tennessee’s General Assembly passed a law that allows carrying guns in state and city parks legal, as along as the individual has a carry permit. “It’s not our intention to interfere with the Second Amendment rights of the people … (but) to provide for a safe environment for the children and public use our park facilities,” Haley said last night. Councilman Toby Gilley disagreed in full, saying he wholly supports the new state law. Gilley was the only councilman who voted against deferring the measure. After literally years of effort, the powerful anti-gun forces in New Jersey politics have finally succeeded in passing a "one handgun per month" bill, which now heads to Governor Corzine's desk for his inevitable signature. A measure sponsored by Senators Sandra Bolden Cunningham and Teresa Ruiz, which would prohibit the sale and purchase of more than one handgun per person, within a 30-day period was approved today by the full Senate by a vote of 21 to 15. Effective, July 1, Nevada will no longer recognize Right-to-Carry permits from Utah or Florida. They have, however, added Ohio and West Virginia as recognized states. Each May, the Nevada Department of Public Safety conducts an audit of states and their Right-to-Carry laws for the purpose of determining which states it will recognize. The Nevada DPS dropped Utah because it does not have a live fire requirement, which is a part of Nevada's training requirements. When the Nevada DPS first began its state by state audit of Right-to-Carry laws in 2007, DPS admitted to NRA representatives that they overlooked the live fire training requirement. After further review, they determined that Utah wasn't similar enough to keep it on the list of recognized states. Article here. I'm not sure why Florida's seven year versus five year permit validity would make a difference, although I suspect that the Nevada DPS was probably looking for any reason to limit the number of recognized permits. Imagine that. The Senate confirmed this week, by a vote of 62-35, a gun banner who stays up at night thinking of ways to impose more gun control upon American citizens. Harold Koh is that gun grabber, and he was confirmed yesterday to be the Legal Adviser at the State Department. On Wednesday, Senate Republicans attempted to kill the Koh nomination with a filibuster -- until eight of them crossed the aisle to help Democrats confirm Koh. Once the filibuster was thwarted, Koh's nomination passed easily. The vote on final passage can be viewed here. More here. Remember those names come election time. A Port Washington, N.Y., lawyer and martial arts enthusiast asked the Supreme Court on Friday to use his case to expand the coverage of the Second Amendment’s “right to keep and bear arms” so that it applies to restrict or bar state and local laws, as well as those at the federal level. James M. Maloney’s petition in Maloney v. Rice is the third case on that point to reach the Court in recent weeks. This one, however, seeks to challenge a ruling that has gained a special prominence because one of the judges on the Second Circuit Court panel deciding against Maloney’s claim was Circuit Judge Sonia Sotomayor, President Obama’s choice for a soon-to-be-open Supreme Court vacancy. The first question asks simply whether the Second Amendment’s guarantee of an individual right (as recognized by the Supreme Court last year in Distict of Columbia v. Heller) applies to the states through the Fourteenth Amendment. The second question asks whether the individual right qualifies as “a privilege of immunity” of individuals, and thus applies to the states through the Fourteenth Amendment’s Privilege and Immunities Clause. Maloney’s lawyers, in the new petition, urged the Supreme Court to agree to hear this new case along with the two previously filed to challenge a handgun ban in Chicago. Article here. Read the petition here, and the petition's appendix here. Imagine that in New York, two pieces of wood connected by a string or chain is considered so ultra lethal that even mere possession of such a thing by residents of that state, in their own homes, is a crime. Note the (mostly) lack of discussion of the importance of weapons until the very end, until Hannity brings it up. Weapons and the knowledge and will to use them are an integral part of survival, urban or otherwise. Certainly only a part, but an essential part nevertheless. Note also the typical clueless reporter, who herself is admittedly unprepared, even apparently on a very basic level. Hopefully she and others will at least start the process of basic preparedness. Otherwise, when a large-scale emergency strikes, these sheep-like folks will become lambs for the slaughter, unable to take care of themselves or provide even the most basic necessities for their own survival. No doubt with lots of plaintive bleating for others to help them. Judge Sonia Sotomayor, President Barack Obama’s first nominee to the U.S. Supreme Court, has a narrow view of the Second Amendment that contradicts the Court’s landmark decision in District of Columbia v. Heller. A heated debate has started in the U.S. Senate over her opposition to the right to keep and bear arms. This issue, which has decided the fate of presidential elections, could also decide her nomination. Gun owners, and especially the members of the National Rifle Association, must aggressively oppose Judge Sotomayor’s confirmation to the Supreme Court. · The comment distracts from the fact that, “significant” or not, there is a negative correlation between Brady grades and violent crime, personal freedom, etc. In simpler words, the higher Brady regards a state, the more dangerous it is to live in for law-abiding citizens, and they suffer more at the hands of the criminals and also their own government. · None of the charts show a positive correlation. In other words, there is no data to support the idea that Brady may at least be partially correct. ... Washington D.C. and Chicago have two things in common: the most restrictive gun laws in the country, and a near-"leadership" position in terms of murder rates. Whether or not one believes that the strict gun laws in those cities actually contribute to the violent crime, it would certainly be difficult to argue that they do much to reduce it. WASHINGTON -- Senate Republicans vowed Wednesday to press Sonia Sotomayor on gun rights -- a politically divisive issue that they hope could potentially weaken Democratic support for the Supreme Court nominee. While Republicans are a pronounced minority in both the House and Senate, they have used the gun issue to their advantage to divert the Democratic legislative agenda, forcing members from moderate and conservative states to take politically risky votes on gun provisions. Sotomayor's judicial record appears to provide the GOP with another opportunity to bring the issue to light. Since the Supreme Court decided in a landmark case last year that restrictive gun laws in Washington, D.C. -- a federal entity -- infringed on a constitutionally protected right to own a handgun, the legal debate over guns has shifted to whether that ruling also affected handgun-control laws in individual states. Earlier this year, Sotomayor was part of a three-judge panel on the 2nd Circuit Court of Appeals in New York that held the Second Amendment didn't apply to the states. At a press conference Wednesday, Jeff Sessions of Alabama, the ranking Republican on the Senate Judiciary Committee, and other senators said they were concerned about the decision and pledged to grill Sotomayor about it at her confirmation hearings, which begin July 13. Has it really been one year since the United States Supreme Court in a disappointingly narrow 5-4 ruling struck down the Washington, D.C. handgun ban and affirmed once and for all that the Second Amendment protects an individual civil right to own a gun that has no connection with militia service? For some, it appears the ruling never happened at all. Even now, gun prohibitionists are loathe to acknowledge that they were wrong about the Second Amendment; that their own hostility toward the private ownership of firearms had led them to conclude – largely by misinterpreting and deliberately misrepresenting the high court’s 1939 ruling in U.S. v. Miller – that the Second Amendment protected only some mythical “collective” right of the states to organize a militia. My colleague, Daniel White, offers an analysis of the ruling here. Gun advocates have a bang-up idea for a picnic in Traverse City. A group called Michigan Open Carry Inc. plans to host a gun-toting picnic at Sunset Park on Saturday. PHOENIX -- State lawmakers agreed Thursday to let some gun owners bring their weapons into restaurants -- but not before they expanded the measure to also apply to bars. That change in SB 1113 came not at the behest of the National Rifle Association which crafted the bill but after a push from the organization that represents bar owners. Lobbyist Don Isaacson of the Arizona Licensed Beverage Association said there is no sharp definition in state law that spells out what is a restaurant and what is a bar. But Rep. Kyrsten Sinema, D-Phoenix, noted that NRA lobbyist Todd Rathner has argued all along that the legislation is aimed at providing relief to gun owners who simply wanted to get a bite to eat and did not want to leave their loaded weapons in their vehicles. She called extending that right to places where food isn't served "a dangerous cocktail." U.S. Sen. Frank Lautenberg has a point, to a point. The Democratic lawmaker from New Jersey says it “simply defies common sense” to allow gun sales to people suspected of being terrorists. He’s right – until he proposes that the government’s terrorism watch list should be the deciding factor of whether someone can buy a gun. At Lautenberg’s request, the Government Accountability Office recently studied firearms and explosives purchases among terror watch list members. It found that people on the list tried to buy guns 963 times in the last five years, and nine out of 10 times they were successful because nothing else in their background disqualified them. That sounds outrageous, but consider this: The FBI refused to divulge details about who was able to buy a gun and what their connection to terrorism might be. That itself makes conclusions rather hard to draw. Then there’s the watch list itself, which has a number of problems, the first being its size. At last count, the list had more than 1 million names representing 400,000 people, and it’s growing quickly. Just four years ago, the list stood at one-fourth of its current size. It’s also rife with errors. While much of the criticism can be attributed to cases of mistaken identity – such “false positives” have snared the likes of Sen. Ted Kennedy and members of the Federal Air Marshal Service – the list itself is also suspect. Just last month, the Justice Department inspector general found that the list included the names of at least 24,000 people who may not have belonged on it. Other names that should have been on the list weren’t. But the most significant concern is the secrecy surrounding such intelligence tools, which doesn’t necessarily make much room for due process. ... It was November 22, 1963 just before 10:30 AM Pacific Standard time; I was sitting in my English literature class, when those words were forever burned into my mind. I had no more finished reading Dickens’ opening paragraph when the school loud-speaker system came on with the disquieting news that "President John F. Kennedy has been shot in Dallas, Texas." As the last girl left the room, the door to the classroom was closed and locked. Turning to those of us remaining; that wise old sage in a controlled but stern voice said: "Gentleman, your world is going to change. I know most of you hunt. I doubt there is anyone here that doesn’t own a firearm. The day is coming when the Federal government is going to try and disarm you. I won’t see it, but you will. Mark my words and be on your guard, the Second Amendment is the only thing standing between you and the suffering you can’t comprehend. Class is dismissed." What experiences had brought that literature teacher to make those proclamations, I’ll never know. Of course, we didn’t see any immediate change in our lives. Groups of us still made the weekly rounds to the Sears’, Wards’, and Penny’s stores to look at and drool over the racks of firearms. We still bought our ammunition from these stores or the local gun shops even though none of us had reached our fourteenth birthday. No one gave us a second look when a troop of us walked through town carrying our weapons on the way down to the river to plink at tin cans or to go bird hunting. Life really hadn’t changed but we often talked about what that literature teacher had said and we wondered what was going to happen. It was as Dickens’ had said, "the best of times…" while the worst times were not having the fifty-five cents it took to buy a box of 22 long rifle shells to plink with or the ninety-nine cents for a box of shotgun shells during bird season. ... A friend’s correspondence concerning what has occurred over the last 50 plus years seems more than appropriate. "I suspect that some of us recognize that with the term ‘sheeple,’ we herd up. We've got a shepherd, big government. That government even has dogs. ‘Don't worry, they're not there to attack you (even though they ... look like wolves), they're only to protect you from the wolves.’ And we buy that. Of course the shepherd is only willing to expend his time and resources because he can fleece us and maybe even sell us as mutton!" A good point to remember: the wolf and the shepherd both seek to use the sheep for their own purposes. The lesson: Don't be a sheep. ... However, the question that we, as pro-gun activists, should be asking is "What are the benefits to the gun-rights movement of my carrying openly?" After all, we are bombarded, almost daily, by a variety of subtle and not-so-subtle anti-gun media messages. And it is amazing how effective this bombardment is, even for those of us with deeply held pro-gun beliefs. It is a dangerous mistake to assume that societal influences do not make an impact. They do! The number of pro-gun, pro-concealed-carry advocates who will chastise open carriers is a prime example of the fact that even we can be influenced to treat firearms as something "somehow unwholesome." At the risk of sounding like a sociology professor, what we are dealing with is a general populace that has had their perceptions about firearms turned into prejudices by societal pressures. Most people are not anti-gun in the traditional sense of the word, but they can be counted upon to swallow whatever drivel is presented by the true anti-gun movement. Make no mistake about it; if we do nothing to counter these negative stereotypes about gun owners, then our rights will be slowly taken away. Open carry is a very easy way to begin to counter these stereotypes. To put it simply, open carry forces those you meet, be they friends, relatives or neighbors, to reconcile their preconceived notions and prejudices regarding firearms with the fact that you are exercising this right in a safe and responsible manner. Prejudice thrives on ignorance. By openly carrying, we are showing the public what gun owners are really like. More importantly, we are showing them who we are. I cannot tell you the number of times that I have heard people say that they do not know any gun owners. They do, of course, but they are not aware that they do. This allows them to buy into the idea that gun owners are different; and people fear and distrust that which is different. Seeing you or I openly carrying a firearm forces them to confront the object of their prejudice. Article here. One point I would quibble with is the idea, mentioned earlier in the article, that concealed carry is "tactically superior" to open carry. Sometimes, sometimes not. It depends. Both open and concealed carry have their advantages and disadvantages. Open carry may be "tactically superior" when you're out hiking, for example, where concealed carry may be less suitable both from a comfort and a accessibility standpoint. In addition, you are probably less likely to be selected as a target if you're both confident and visibly armed. Certainly, in urban environments especially, concealed carry has much to recommend it from a tactical standpoint. But as the article notes, concealed carry does nothing to dispel negative stereotypes about gun owners. Open carry makes a statement; concealed carry does not. ... Thus, the major questions facing the US economy are based on government policy initiatives, which is rarely a positive factor in forecasting. Barring massive investment in nuclear energy and further hydropower projects (the scope for which is limited in the US), there is no way to obtain "green" energy that is not considerably more expensive than current energy sources. This will cut US disposable personal and business incomes significantly, and strike another blow at domestic manufacturing. There is no way around it. All countries which have heavily invested in "green" power have cut jobs, raised consumer energy costs, and impaired their own economies. We will not be any different. Read her post here. You can be reasonably certain that if we do hit that iceberg, Obama and the political elites will be the first on the lifeboats. As you may recall, the Titanic didn't have enough lifeboats for everyone (she only carried lifeboats for about half of the people on board), so the rest of us will be left to go down with the ship. doesn’t rhyme and I don’t care. Should there be a background check for national reporters? One wonders. On June 21, CNN’s Anderson Cooper aired a special report for CBS’ “60 Minutes.” In this report, Cooper repeated the tired, discredited, blatantly incorrect idea that 90% of Mexican drug cartels’ arms supply comes from the United States. In addition, Cooper showed some interesting B-roll footage of seized weapon, some of which clearly cannot be bought on the civilian market. Initially, one might note the M16A1, M16A2, M4, and what appears to be a standard NATO-issue M60. In the previous article, we examined how states considered the best by the Brady Campaign also have higher police officer density (more cops per 100,000 population). However, these states also have the highest violent crime and murder rates. Another article examined how Brady’s favored states had the lowest levels of firearms ownership. For review purposes, the following charts show that as gun ownership levels increase, Brady scores, violent crime, and murder rates all decrease. The genius of concealed carry of handguns is that would-be murders remain uncertain as to who is armed and who isn't. This is true for everyone interested in being as safe as they can be from future violence, because it comes to the realization of specific unalterable realities: you're on your own. This week some Southern California Church Leaders came to that very same conclusion, and took up a position advocating not only a very discreet security presence of professionals, but also took the advice of their consultants and adopted the policy of advocating concealed carry of handguns among the congregation. Comment: The only problem, of course, is that concealed carry permits are quite difficult for "ordinary" citizens to acquire in Southern California. Less than 24 percent of the guns seized last year by Mexican authorities, mostly from drug trafficking organizations, were traced back to the United States, according to data released in a report by the Government Accountability Office. Of the 30,000 guns seized by Mexican authorities in 2008, only 7,200, or approximately 24 percent, were submitted to the U.S. for tracing. Of those 7,200 firearms, 6,700 (or about 22 percent) were actually determined to have originated in the United States. I've been thinking about learning how to fire a gun, maybe even buying one. Now if you are a lifelong conservative, Red State dweller, and NRA member, you might be thinking, "Big yawn. What's next? She'll be telling us what she had for breakfast?" So let me try to convey to you the enormousness, the Alice in Wonderland quality of my even posing the question, something I've never, ever considered in my life. No one I know owns a gun. I've never seen a gun (well on a holster of a police officer but I never wanted to get up close and personal with it). I have given lots of good money over the years for gun control. Learning to fire a gun seems as ludicrous as deciding to take up brain surgery. But, I am rethinking absolutely everything. There is not a single thing that I believed, that I held absolute and holy, that is not up for grabs. My brain is in a tizzy 24/7 and I don't know if up is down, or if east is west. Read the rest here. Unfortunately, even if she were to acquire a gun, getting a carry permit in Berkeley will likely be quite difficult (or more likely, impossible) for an "ordinary" citizen. But at least the lightbulb appears to have been turned on for her on the morally righteous nature of armed self-defense. Baby steps, baby steps. Impressive. I got tired just looking at the video. The officer gave an order and soldiers herded the family outside while other troops called the entire town out into the square. There on the town square the SS machine-gunned the entire family -- father, mother, Charley's two friends, their older brother and a baby sister. Gun registration is a necessary prelude and precondition for effective gun confiscation. That's why it's important to educate all gun owners, particularly new gun owners, on why they must resist gun registration schemes. When the U.S. Supreme Court convenes for its next term in October, it will have an opportunity to correct one of the most glaring examples of judicial activism in our nation’s history -- when justices placed their personal preferences above the law. Specifically, the Court will have the chance to reconsider an 1873 decision that is as ugly in name as it is in effect. The Slaughter House Cases essentially deleted from the Constitution a key bulwark of liberty and helped create the conditions for the modern welfare state. The opportunity to correct that mistake arises in the latest battle over gun rights. Last summer, the Supreme Court in District of Columbia v. Heller held for the first time that the Second Amendment protects an individual right to keep and bear arms. But because Washington, D.C. is a “federal enclave,” that decision only applied to the federal government. The question now is whether the right to keep and bear arms should apply to state and local governments as well. One federal appellate court recently said yes, but two said no. The Supreme Court has been asked to resolve that conflict. The words “privileges” and “immunities” may be unfamiliar today, but 19th-century Americans used them interchangeably with a term modern Americans know very well: rights. And two rights the Fourteenth Amendment was clearly intended to protect were armed self-defense and economic liberty, which includes the rights to own property, enter into contracts and earn an honest living. Officials throughout the South systematically violated those rights to keep newly freed blacks and white abolitionists in a state of poverty and terror. The whole point of amending the Constitution was to end those abuses. But the ink was scarcely dry on the Fourteenth Amendment when five justices of the Supreme Court defied the popular will and recast the Privileges or Immunities Clause as little more than a rhetorical flourish. In the Slaughter House Cases, the Court rejected a Fourteenth Amendment challenge to a corrupt, government-chartered monopoly on the sale and butchering of livestock in New Orleans on the grounds that the right to earn a living was not a privilege or immunity of American citizenship. There followed a series of cases in which the court held that basic civil liberties like free speech, assembly, and the right to keep and bear arms were not among Americans’ “privileges or immunities” either. Article here. As Mr. Neily notes, the Supremes could use the Second Amendment issue to take a more logical and holistic approach to the Fourteenth Amendment's purpose, rather than the current piecemeal "selective incorporation" approach. Indeed, Justice Scalia may have suggested as much in his Heller opinion. Tonight's biography lesson, an interactive painting of influential people throughout the ages. Place your cursor over a figure to see the person's name, click to go to that person's Wikipedia entry. ATF harrassing gun owners in border states? Article here. Know your rights. Don't let yourself be intimidated. See my post here on your right to remain silent (and why you should use it). The recession has put the brakes on all sorts of industries, but the upward spike in gun sales that began about the time President Obama was elected continues. In California, for example, sales over a six-month period late last year and early this year are up 32 percent from the same period a year ago. And while no national figures on gun sales are available, the FBI reports a strong surge in applications for background checks — the best available indicator. PHOENIX — Siding with gun owners over cops, the Senate Judiciary Committee agreed Friday to let people carry concealed weapons without getting a state permit. The U.S. Army has ordered 38.4 million rounds of .300 Winchester magnum ammunition for its newly modified M-24 sniper rifles, as well as similar SOCOMs Mk13 models. The new ammo will cost about $1.30 per round. The .300 Winchester magnum will be ordered in minimum lots of 56,160 rounds (117 boxes of 480 rounds each). The entire 38.4 million rounds will last a while. Mexico's police are overwhelmed in part because drug traffickers have them outgunned. Mexico's Attorney General Eduardo Medina-Mora is helping lead the effort to break up the cartels. "Half of what we seize, 55 percent are assault rifles. And this is what gives these groups this intimidation power. Over 17,000 assault rifles, throughout the last two years. Two thousand and 200 grenades, missile and rocket launchers. Fifty caliber sniper rifles," the attorney general explained. It might surprise you to learn where all these guns are coming from. It turns out 90 percent of them are purchased in the US. "The Second Amendment was never designed to arm criminal groups, and especially not foreign criminal groups as it is today," Medina-Mora said. KINGSTON, Jamaica -- Ships from Miami steam into Jamaica's main harbor loaded with TV sets and blue jeans. But some of the most popular U.S. imports never appear on the manifests: handguns, rifles and bullets that stoke one of the world's highest murder rates. Comment: Jamaica has had some of the strictest and most draconian gun controls in place for decades, yet criminals are still well armed. If you can't eliminate guns from an island nation (just ask the Brits), you cannot possibly expect to do so in a nation with land borders. Duh. Jamaican criminals are well armed. The only people in Jamaica who want guns but don't have them are those who obey the law. Comment: Denying a fundamental human right based on a classified list reportedly riddled with inaccuracies and subject to no meaningful judicial oversight, with inclusion on the list at the whim of government bureaucrats and without due process, is something worthy of a police state, not a free republic. Of course, Lautenberg is probably quite comfortable with such police state tactics. BATON ROUGE -- Legislation urging the New Orleans City Council to enact a citywide ban on assault weapons was shot down by a Senate committee Tuesday. The Judiciary B Committee failed to muster a single vote for House Concurrent Resolution 150 by Rep. Cedric Richmond, D-New Orleans, killing it unanimously. The non-binding measure is an expression of the feelings of the Legislature on an issue and would have called on council members, but not required them, to act. [The chart] includes the total outlay for all the bailouts to date. 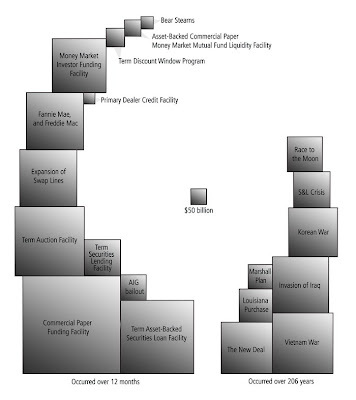 In just about one short year (March 2008 - March 2009), the bailouts managed to spend far in excess of nearly every major one time expenditure of the USA, including WW1&2 (omitted from graphic), the moon shot, the New Deal, total NASA budgets (omitted from graphic), Iraq, Viet Nam and Korean wars — COMBINED. This level of spending totally blows away anything else in human history. What are the chances we'll have a good result? A lawyer and a blond are sitting next to each other on a flight from Los Angeles to New York. The lawyer asks if she would like to play a fun game. The blond is tired and just wants to take a nap, so she politely declines and rolls over to the window to take a nap. He explains how the game works. "I ask you a question, and if you don’t know the answer, you pay me. You then ask me a question, and if I don't know the answer, I pay you." Again, the blond politely declines and tries to get some sleep. The lawyer figures that since his opponent is a blond he will easily win the match, so he makes another offer, "If you don’t know the answer, you pay me only $5, but if I don’t know the answer, I will pay you $500." The blond figures there will be no end to this torment unless she plays, so she agrees. The lawyer asks, "What’s the distance from the Earth to the moon?" The blond reaches in to her purse, pulls out $5 and hands it to the lawyer. Then she asks the lawyer "What goes up a hill with three legs, and comes down with four?" The lawyer is puzzled. He uses his laptop to search for references. He taps into the air-phone with his modem and searches the Internet and the Library of Congress. Frustrated, he sends emails to his co-workers and friends. No luck. After an hour, he gives up. He wakes the blond and hands her $500. The blond politely takes the $500 and turns away to get back to sleep. The lawyer, who is going nuts trying to figure it out, wakes the blond and asks, "Well, so what goes up a hill with three legs and comes down with four?" The blond reaches into her purse, hands the lawyer $5, and goes back to sleep. BOSTON — Massachusetts’ highest court plans to review the constitutionality of state law that requires gun owners to lock their weapons. The Supreme Judicial Court decided to look at the law after a District Court judge cited a U.S. Supreme Court decision in dismissing firearms charges against a Billerica man who had been accused of keeping unlocked weapons. Twenty-three attorneys general went on record last week, asking the federal government in a letter to not re-impose the so-called assault weapons ban. Ohio Attorney General Richard Cordray was not among them. The issue was pretty much off the table, with the exception of a few people on the far left who simply don't think anybody should have any firearms at all. Then U.S. Attorney General Eric Holder created a furor when he said the Administration would like to renew the expired ban. The bipartisan group of states attorneys general sent a letter to Mr. Holder on June 11. Although it included predictable states from the West and the South, it also included attorneys general from places like Michigan, Wisconsin, Florida and New Hampshire. Comment: Note that the op-ed was written by a county prosecuting attorney who is running for Attorney General. I think the Europeans, who, remember, caught Obamania quite early, thought they were going to get more of the bipartisan American security shield, albeit with a charismatic multicultural veneer that would resonate with their citizens: no more Texas. No more Christianity. No more twang. No more nuclur. No more Iraq. But same old NATO. Same old bad cop to their good cop. Same old wide open Ami economy. Same old chance for triangulation. And? As we are seeing in the Middle East, in the case of Israel, with Turkey, on the recent Iranian upheaval, and during the South America visit, Obama is clearly to the left of Europe. He sees himself more as multicultural prophet born out of the Third World, foe of colonialism, angry at past imperialism, skeptical of capitalism, eager to showcase his non-traditional ancestry and tripartite nomenclature. By coming from the West, but separating himself from the history of his own country, Obama has become a citizen of the world, who polls far higher, as intended, in the Middle East, than does his own country. It used to be cute to talk about how “Bush turned off the Europeans.” Perhaps. But beneath all the public demonstrations and burning effigies, the old guard knew that Bush, like Clinton, Bush, and Reagan (but not Carter), would be there should the Russians, Koreans, Chinese, the lunatic regimes in the Middle East, the Al Qaedists and the rest threaten Western interests. I don’t see how they can assume such a thing any more. From the trivial like the treatment of the Churchill bust or the DVD gift to Gordon Brown, to the profound like the serial apologies, voting present on Iran, and deer-in-the-headlights stance on Korea, they must assume that the “European Rapid Deployment Force” is now their primary bulwark against the foes of civilization. ... I view the passage of HR 627, a credit card reform bill with the highly publicized national park gun amendment attached, as valuable testimony for my past claims that the war to preserve the sanctity of the Second Amendment has been won. Clearly, most politicians are so gunshy about any recordable vote casting them as anti-gun and lowering their NRA grade – and therefore making them vulnerable to defeat in the next election – they go to untold lengths to avoid it. TAMPA - About a month ago, Audry Sauceda was carjacked and fought back. He stuck a gun in my side and told me to get out of the car," Sauceda said while sharing her story with FOX 13 on May 15. "And I pulled out my gun and stuck it in his face, and told him, he needed to get out. He screamed and jumped out of the car." It's been almost a year now since the June 26, 2008 landmark ruling in which the Supreme Court overturned the strictest gun-control law in the country, a ban on handguns. And since then, Florida has been dealing with a rush of requests for concealed weapons permits. MEMPHIS, Tenn. - When Performa Entertainment Real Estate and the Beale Street Merchants Association failed to convince state lawmakers Beale Street should be exempt as a historical district, they came up with another plan in order to keep guns far away from its restaurants and bars. "Our paramount concern is to provide for the safety and enjoyment of our guests and we're going to take any and all measures necessary to do that," said Onzie Horne Jr., Executive Director of the Beale Street Merchants Association. Now weapons are banned on Beale starting the first weekend after a new state law allowing guns in bars takes effect. "While we are certainly for second amendment rights and the rights that go with them we thought it was a bad bill," said John Elkington with CEO of Performa. Beginning July 17th visitors to Beale Street can expect to be screened with metal detector wands at all entry points. Those enforcing the new ban liken it to the kind of security you experience at the airport. NASHVILLE — The bill to close public access to records identifying Tennessee’s 220,000-plus handgun-carry permit holders fell three votes short of winning approval in the state Senate on Wednesday night. A D.C. Council member has reintroduced legislation to equip guns used by the District's police forces with cameras after a man was fatally shot by police in Northeast. Council member Harry Thomas Jr. on Tuesday introduced a bill requiring Mayor Adrian M. Fenty to come up with a "plan for the installation of video and audio recording devices on service firearms of all police and special police officers." Two key provisions of Philadelphia's latest attempt to impose local gun controls - banning assault weapons and "straw purchases" of handguns - were invalidated yesterday by a state appeals court. Following judicial precedent that doomed previous Philadelphia gun-control laws, Commonwealth Court held that the state Supreme Court ruled in 1996 that only the legislature has the authority to enact gun laws. Counties and municipal governments are out of luck. But the 6-1 majority in Commonwealth Court affirmed part of the 2008 decision of then-Philadelphia Common Pleas Court Judge Jane Cutler Greenspan and allowed three other provisions. They require reporting lost or stolen handguns, allow temporary seizure of guns by police after probable cause is demonstrated, and bar gun ownership by people subject to protection-from-abuse orders. Greenspan, now on the Pennsylvania Supreme Court, had ruled that the National Rifle Association and other challengers were not affected seriously enough to have legal standing to sue over those provisions. HOUMA — In 15 years of selling guns and ammunition, he’s never seen anything like it. Shotgun shells, rifle cartridges and pistol rounds have been flying off the shelves with such speed at Houma Auto Parts, Calvin Prevost’s gun store on Honduras Street, that the owner has taken to hiding what ammunition he can in the back so customers who buy a gun can leave at least with a single box of rounds. Wednesday afternoon, there were wide gaps between the boxes of ammunition for sale at the shop, formerly an auto-parts and gun store but now strictly a firearms business. FRANKLIN — State lawmakers have put local officials on the hot seat with the recent passage of a law allowing guns to be carried in public parks. The D.C. government released emergency regulations yesterday that greatly expand the models of handguns that District residents can own, a shift designed to stave off another lawsuit over its compliance with the Second Amendment. Labels: Florida, Gun Control, Louisiana, Montana, National Parks, Tennessee, Washington D.C.
Greetings. As president of United States -- or, if you prefer, the Great Satan -- I have have been following with keen interest the vigorous post-election debate and vibrant political dialogue which has been taking place in your great and noble Islamic Republic of Iran over recent days. It has been both educational and fascinating, and as a sports fan I have thrilled to the pageantry, the suspense, and the fast-paced, hard-hitting action. I have to say It's been as exciting as a double overtime game seven NBA final between the Lakers and Celtics! Like millions of others around the world, I can't wait for the exciting conclusion of your distracting nail-biter so I can finally focus on my big health care project at the office. (Now that's what I call a real crisis!) But no matter who prevails in your hard-fought contest, you can rest assured that I will be out there in the stands watching, and ready to congratulate the team who brings home Tehran's coveted Golden Centrifuge Cup. Now, I know that our two nations have had our differences in the past, and so it would be totally understandable if some of you were possibly upset my previous statements expressing "troubled concern" and "measured consternation" over your current situation. Please, do not interpret those statements as somehow taking one side or the other. I was not trying to be provocative or inflammatory, and far be it from me to interfere or play favorites. As we say over here in the Great Satan, "I don't have a dog in this fight," and so I was merely "calling 'em like I see 'em." Frankly, if America is going to regain respect as a geopolitical superpower, we need to make the tough call to sit quietly on the sidelines. That's why I have instructed my diplomatic team remain strictly neutral and to "let 'em play." With time and patience, I hope you will come to think of us as a bigger, flatter version of Switzerland. With less yodeling. Bulldozers, the new urban revival tool? Obama: Who do you trust, me, or your lying eyes?